Ugadi is the first day of the first month of Hindu calendar, Chaitra. Find here more information on its origin, celebration, customs & traditions and date in 2017 & 2018. Ugadi is the Hindu New Year that is celebrated pompously mainly in Karnataka, Andhra Pradesh and the state of Telangana. According to the 'Saka' calendar, Ugadi is celebrated on the first day of the first month of the year, 'Chaitra'. The month of 'Chaitra' usually coincides with the month of March-April. This festival is considered highly auspicious. People hang mango leaves and fresh flowers at the entrance of their houses and make colourful 'rangolis' at the threshold. There are distinctly two types of Ugadi. The first is called 'SauramanaUgadi', which occurs when the sun enters the 'Mesha Rashi' or 'Aeries'. The Second type is called 'Chandramana Ugadi', which occurs after the first new moon. The latter is chosen as the Hindu New Year and is celebrated as the festival of Ugadi. The term Ugadi is derived from the Sanskrit word 'Yugadi' which can be further broken down into 'Yuga' meaning 'period or age' and 'Adi' meaning 'to begin or start'. Thus, Ugadi means 'the beginning of a new age'. It marks the 'new age' for people between the 'Vindyas' and river Kaveri who follow the South Indian lunar calendar. They celebrate the festival with great zeal, inviting family and distant relatives for a sumptuous and filling feast. It is popularly believed that on Ugadi or 'Chaitra Suddha Padhyami', Lord Brahma created the vast universe. Along with the universe he created days, weeks, months and years in order to count time and then he created all other elements present in the universe. The calculations of the great Indian Mathematician Bhaskaracharya also corroborate that Ugadi is the beginning of a fresh year. Ugadi is primarily celebrated in the states of Andhra Pradesh, Telangana, Maharashtra, Karnataka and Goa. India is a diverse country with a variety of languages and communities. This diversity reflects the celebration of a number of festivals and so is the case of 'Ugadi'. The festival is called by different names across various regions and communities in India. In Andhra Pradesh and Telangana it is called 'Ugadi', in Karnataka the festival is called 'Yugadi'. In Rajasthan it is called 'Thapna', in Maharashtra it is known as 'Gudi Padwa', Sindhis call it 'Cheti Chand' while Manipuris celebrate it as 'Sajibu Nongma Panba'. The Hindus of Indonesia and Bali call it 'Nyepi'. 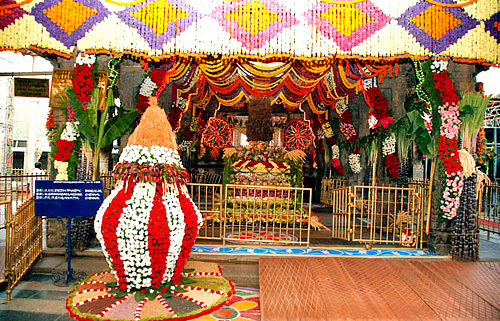 When it comes to preparatory activities for the festival, people begin all preparations weeks before Ugadi. People white wash and clean their houses a week in advance. Families are spotted together in markets, buying clothes for the festival. On the day of Ugadi, people wake up at sunrise and take a shower. Usually holy oil is used as an ointment on this day. New clothes are worn by all members of the family. Fresh mango leaves adorn the entrance of the house as these leaves are considered very auspicious and are said to bring plenty of good fortune. There is an intriguing tale that supports the use of mango leaves. Legend has it that once a sage called 'Narada' brought a mango as a gift for Lord 'Shiva' and 'Parvati'. However, this mango could not be shared and had to be accepted only by one person. Hence, 'Shiva' and 'Parvati' returned it back as both did not want to deny the other of it. Seeing this, 'Ganesha' and 'Kartikeya', the sons of Lord Shiva asked for the mango and began to bicker, as both of them loved eating mangoes. In order to end the quarrel 'Parvati' decides that both the brothers would have to compete with each other to win the mango. 'Narada' makes a suggestion that the brothers must circle the earth three times and whoever returns first shall win the mango. 'Kartikeya', being more agile of the two brothers, was confident and immediately set out on his peacock. The witty 'Ganesha' knew he could not beat his brother and so he thoughtfully asked his parents to stand together and he circled them three times professing that they were his world. Upon returning, 'Kartikeya' was astonished to see the mango with 'Ganesha' when he learned of his brother's intelligence he smiled and proclaimed that from that day onwards, mango leaves should be used as a symbol of prosperity. On this day flowers, especially jasmine, is used to decorate temples. Fresh cow dung water is splashed before the entrance of every home. The family deity is then worshipped and members of the family pray for the well-being and prosperity of each other. A 'prasad' of bitter neem leaves and jaggery is prepared. People chant mantras and 'pundits' make predictions for the coming year. 'Panchanga Sravanam' is held, where people listen to the yearly calendar. Since Ugadi marks the season of spring, aromatic mangoes are found in abundance. Some special dishes like 'Obbattu' in Karnataka and 'Bobbattu' in Andhra Pradesh are prepared on this day. Ugadi Pachadi is a traditional treat that is prepared on the special occasion of Ugadi. It is a harmonious amalgamation of seasonal ingredients made of raw mango, fresh jaggery, neem buds, green chilli or pepper, salt and tamarind. Each ingredient carries a special significance - neem buds are used for bitterness that signifies sadness; sweet jaggery indicates joy; hot green chillies denote anger; salt signifies fear; sour tamarind indicates disgust/ an unpleasant taste and tangy raw mango symbolises surprise. This traditional dish is a gentle reminder to both, young and old, that life brings equal measures of all the above emotions. Thus, it is on this day that people pledge to face the events of the coming year with courage, patience and strength. To accept all that comes their way with endurance and to transcend the odds that cross their path in the journey of life. 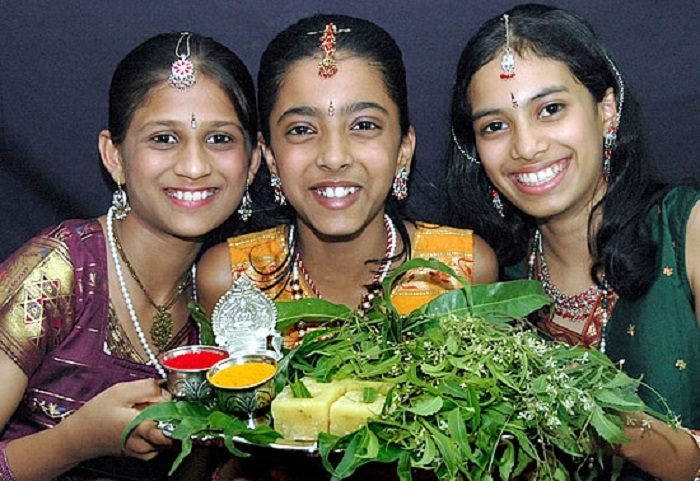 This is the pivotal revelation and significance of the celebration of Ugadi.